5. Rien que nous deux.. Reaching for the album entitled Chamber Quintet, many of you may be asking where the idea came from to record improvised music on oboe, bassoon, cello, double bass and drums? This concept came out of listening to the fascinating Phantasy op. 32 by Benjamin Britten, a piece for oboe and string trio. The combining of oboe and bassoon sounds with those of cello, double bass and drums seemed to us to be an inspiring and creative challenge. While working on the compositions we asked ourselves who invite to our new project? It is well known how few improvising bassoonists, oboists or cellists there are on the world. We felt from the very beginning on, that one person who would play exactly as we hoped is the American cellist Erik Friedlander, enchanting audiences not only with his sound but also with his instrumental mastery. We could not imagine to realize this project without the bassoon of Michael Rabinowitz either. This absolute virtuoso is one of the few musicians in the world who can improvise on this instrument with such freedom. We started our quest with our first fascination – the oboe. Emmanuelle Somer turned out to be the ideal partner, with her pure and sophisticated sound on that instrument, coupled with her abilities on the English horn. All the musicians accepted our invitation to record really quickly, then came the most difficult and time-consuming part of setting up this collaboration: finding the dates for our musical rendezvous. After only a few minutes playing in the studio we could feel how experienced were the artists we were having the opportunity to work with. We had spent over two years on the music for this work, and finally here we were, in the studio, bringing it into existence. 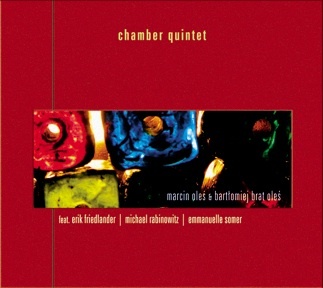 In a similar, if less successful vein, is Chamber Quintet, a classically inspired outing lead by Polish brothers Marcin and Bartlomiej Brat Oles. Featuring Dutch multi-reedist Emmanuelle Somer, bassoonist Michael Rabinowitz and cellist Erik Friedlander, the album is a motley assortment of styles - jazz, classical and hard rock - that results in a work impressive in its spontaneity and disappointing in its compositional shortcomings. Granted, the solos are solid but the compositions don’t unfold organically. “Eternity”, “Rien que nous deux…” and “Desert Walk” redeem Chamber Quintet somewhat with their ghostly beauty and masterful solos but in the end, one is left with a bitter taste from this compositional “grab bag”. Although the title of this great disc is 'Chamber Quintet', which often refers to a small classical chamber ensemble, this is a partially improvised quintet. No doubt you know all about the incredible cellist Erik Friedlander from his extensive work with John Zorn, Dave Douglas, Ellery Eskelin & Myra Melford, well as his half dozen+ discs as a leader. Michael Rabinowitz is another of those under-recognized local legends and one of few musicians who can play complex classical works and bebop lines on a bassoon. Double-reeds specialist, Emmanuelle Somer, is another under-recognized (Belgium-based) wiz who has 3 great discs out under her own name and has worked with downtown's best: Jim Black, Chris Potter & Peter McCann. This session was organized by the Oles brothers, Marcin & Brat, from Poland and one of the finest new rhythm teams in Europe, having recorded with David Murray, Theo Jorgensmann, Rudi Mahall, Ken Vandermark and a number of Poland's best. Brat Oles wrote all but two of these pieces, his brother the other two. This is some superbly written and immensely well-played chamber music, yet the rhythmic schemes is closer to modern jazz. "Galileo" has that prog-rock sort of groove in the mid-section, yet the oboe reminds me more of early Oregon. The thoughtful writing is consistently interesting, often very subtle and never too dense. Plus, on a few these pieces the oboe, bassoon, cello and acoustic bass get a chance to take some inspired solos. On Marcin's "Rien que nous deux", the cello and bass play well together, bowing and weaving their lines as one lush ball of wool. Only on a few of these pieces, like "Horror vacui" does the quintet take off into an impressive and intense free section. For myself, this music is a much-needed change of pace from the more extreme intensity/ of free/music or noise. Polish twins Marcin Oles & Bartlomiej Brat Oles are amazing composers, startling musicians and sensitive characters. Bassist Marcin Oles and drummer Brat Oles awe us with their authorship on Chamber Quintet by the variety and freshness of the melodic climate which they invent at every moment. Marcin & Brat Oles composed this music, inspired by “Phanthasy op. 32” written by Benjamin Britten. With an audacity, they wanted to combine oboe and bassoon reverberations with those of cello, double bass and drums. The challenge culminated in eleven masterpieces. Chamber Quintet also features highly spirited musicians Emmanuelle Somer, Michael Rabinowitz and Erik Friedlander. The eclectic Somer has explored jazz with her impressive talent and abilities to master instruments and musical subjects. A traveler throughout the world, she has enriched her musical path. Somer’s phrases are a model of subtlety. Her interpretations convey great victory in her art/craft … and her horn is of a language which opens out using a clean sonority with incredibly wide nuances and amazing casting. Rabinowitz’s bassoon summons a broad emotional range of sounds. New York's Erik Friedlander strikes us with his constant melodic invention, which exceeds and inspires geniality. As soon as he puts his hands on the cello there is a discernment to combine the approaches and to mix techniques: phrases with the melody on the bottom and syncopated expressions in the acute medium with robust bragging which can be superimposed with improbable harmonies. Bassist Marcin Oles boasts with his string technique as well as his discerning glance. One feels in Oles a wistful step and a maturity which does not choke in its energy and its patience. Oles pizzicatos are dwelling in miscellanea joy and fury while his staccatos are performed with babbling needs, sometimes high, sometimes strong, and sometimes compelling. Marcin Oles’s stringed attitude, excavating the sounds and transcending the duration, is more than one fair promise. A plenteous imagination, a breaching necessity and an elegant improvisational ability extracted Bartlomiej Brat Oles from the middle of the boiling creative Polish jazz scene. His brushes and sticks --which I believe has his own copyright-- combines precision and lace-making smoothness with a delirious imagination. It is blissful to discover Marcin Oles’s double bass and Brat Oles’s cymbals and drums pas de deux. Marcin & Brat Oles’s Chamber Quintet is inspired with beauty, passionate musical alchemy, and great celebration. The delicacy of this quintet as well as its lyricism without any assignment is unarguable! Sięgając po album zatytułowany Chamber Quintet, wielu z Państwa zapyta skąd pomysł, aby nagrać muzykę improwizowaną na oboju, fagocie, wiolonczeli, kontrabasie i perkusji? Ta koncepcja powstała po przesłuchaniu fascynującej Phantasy op. 32 Benjamina Brittena na obój i trio smyczkowe. Zestwienie brzmienia oboju i fagotu z wiolonczelą i kontrabasem w połączeniu z perkusją wydało się nam inspirującym i twórczym wyzwaniem. okazało się ustalenie terminów naszego muzycznego spotkania. Już po kilku minutach pracy w studio poczuliśmy z jak doświadczonymi artystami dane jest nam pracować. Na naszych oczach powstawała muzyka, nad którą pracowaliśmy przez ponad dwa lata. Każda następna płyta braci Olesiów wzbudza silne emocje. Oto zespół, który w swojej twórczości czerpie inspiracje – jak sami muzycy przyznali – nie tylko z czarnych korzeni jazzu, ale także z muzyki współczesnej i koncertowej. Jest to, zdawałoby się, połączenie doskonałe. Ile razy słuchając muzyki współczesnej, nie marzyliśmy o tym, żeby muzycy uwolnili się ze sztywnego zapisu nutowego, albo ile razy po przesłuchaniu kolejnej płyty jazzowej, nie mieliśmy chęci usłyszeć tego wszystkiego w wykonaniu instrumentów orkiestrowych? Marcin Oleś i brat Bartłomiej podobnym życzeniom wychodzą naprzeciw i robią to znakomicie. Skąd pomysł na muzykę improwizowaną przy asyście oboju, fagotu i wiolonczeli? Jak sami przyznali – koncepcja ta powstała po przesłuchaniu Phantasy op. 32 Benjamina Brittena. Tym razem do studia zaprosili światowej sławy muzyków – amerykańskiego wiolonczelistę Erika Friedlandera, fagocistę Michaela Rabinowitza oraz oboistkę Emmanuelle Somer. Wybór nie był łatwy, jak wiadomo szkoły muzyczne produkują muzyków, którzy bezbłędnie odtwarzają utwory różnych kompozytorów, natomiast niewielu jest na świecie improwizujących artystów orkiestrowych. Lepiej jednak trafić nie mogli. O tym jak trudno skonsolidować dwa tak odrębne kierunki muzyczne, świadczy ta płyta. Naturalne jest kojarzenie Chamber Quintet z dawniejszym dokonaniem muzyków – albumem Contemporary Qartet. Tam jednak mieliśmy kompozycje oparte na twórczości m.in. Pendereckiego, Lutosławskiego czy Bacewiczówny, a przy tym wciąż były one jazzowe. Tutaj bracia tworzą własne improwizowane utwory. No i faktycznie – momentami słyszymy prawdziwy, autentyczny jazz z pulsującym basem i perkusją (Galileo, Eternity), a rożek angielski czy fagot obracają się gdzieś wokół rytmu, tworząc niezwykłe melodyjne brzmienia. Kiedy indziej zaś utwory brzmią jak kompozycje muzyki współczesnej (Source). Tylko czasami muzycy próbują te dwie konwencje ze sobą połączyć (chociażby w otwierającym album Abyss), jednak z różnym skutkiem. Najlepiej zespół brzmi wtedy, gdy za konstrukcję bierze sobie muzykę poważną i na jej bazie próbuje improwizacji – i dla tych momentów warto tej płyty posłuchać.